December’s reading. Photo by Vickie Bates. We’ve reached the end, Dear Readers, and I’m thrilled to tell you that I achieved my 2012 reading challenge – finishing at least 52 books in 52 weeks! Thank you for taking this journey with me. I’ll save the musings on What I Learned from Reading 52 Books in 52 Weeks for a later post. Though the book-lovers among you might want to note that when it does appear, that post will involve a reader giveaway of some of my favorite books of 2012. I would like to thank the amazing Chris Lam, the woman behind the terrific What I Run Into blog, who introduced me to annual reading challenges in the first place and provided long-term inspiration. Chris recently completed her own challenge, reading 50 in 2012. Go, Chris!! Standard disclosure: I bought the Meek book, borrowed The Flame Alphabet from my local library, and received the other two as gifts. All four are included in my Amazon Affiliate store. I receive a small percentage of each sale made through that widget. All opinions here are my own. 4 down, 52 + 3 completed! A novel about rock ‘n’ roll and science? You’d think I’d be in geek heaven. Except rarely have musician characters been done so wrong – these are the rockers who should hope to die before they get old. The scientists hardly fare better. As with the ludicrous plot of Ann Patchett’s State of Wonder and the recent movie “Contagion,” we get another piece of popular culture depicting researchers who test vaccines on themselves. It doesn’t translate that a vaccine that’s safe and works in one person will ever work for another human being (that’s why regulatory agencies mandate clinical trials). You don’t want your lead researcher, who’s trying to stop a deadly contagion, to die suddenly, taking all her knowledge with her and setting back progress by months if not years. The novel suffers from being in the heads of too many characters. We’re not with the main characters long enough to get close to them. After darting from perspective to perspective, the reader finds herself in the head of a peripheral character – the mother of one of the scientists – on page 231. In a 401-page novel. This is too late to introduce a new point of view, which is dropped anyway, just as suddenly as it appeared. Bec, the valiant malaria researcher, is given a variety of motivations for everything she does yet none are believable. She discovers a parasite that may or may not guard against malaria, but the side effects bring on sudden blindness. She names the parasite after her father, a hero soldier, and deliberately infects herself with it. Her admiration for her dead father – and her inability to let go of the living parasite that now bears his name – is supposed to be her rationale for not taking medicine to kill the parasite, which is causing said blindness, so that she almost kills Alex, the man she loves, in a car accident. She continues to refuse to take the medicine, even when Alex asks her to, even when they try to get pregnant. Right. Because that would happen. Alex, meanwhile, is the unlikely scientist and former drummer for a ‘70s-style band, led by Bec’s brother, Ritchie, and his wife Karin. Ritchie is the target of a labored blackmail scheme by a tabloid editor who used to be in love with Bec. While Bec’s parasite drama unfolds, we get chapter after chapter of Ritchie sweating it out as he waits to see his name smeared in the Fleet Street rags. One reason this never happens is because the blackmailer at first gives him a year to cough up something nasty about his sister to save his own reputation. When that time runs out, the blackmailer gives him several more months. A daily tabloid?! Never in a million years. Okay, but is fiction supposed to be realistic? Don’t we read to escape ordinary life? And don’t we want authors to create never-before-realized new worlds for us to explore? Yes, yes and yes. Fiction doesn’t always have to be about real life, but when a writer devises a story, he must choose to set it in the world we live in (realism) or some other world (sci-fi, fantasy, etc.). Whichever he chooses, the bargain he makes with the reader is to establish the rules of that world. That’s the fourth wall Meek keeps breaking. We’re in our present, everyday world and characters need to act and react in ways that make sense for their own motivation and for the world; they can’t do things just because it’s convenient for the author. For example, the only reason Ritchie has more than 12 months to deal with his blackmailer is because the author has nothing else for the character to do while he plays out Bec and Alex’s love story. I read this novel back-to-back with The Flame Alphabet (reviewed below) which offers a world like ours, perhaps slightly in the future or diverted a bit from history as we know it. It was difficult to read because the author places us so firmly in that world that he never breaks the fourth wall – we’re there, the world is different in small ways all around us, and we’re never jerked back to our own world for a little respite or explanation. We have to figure it out as we go along. That is the best kind of reading, tough though it may be, because it assumes the reader has the intelligence to understand what’s going on. Meek is trying so hard to push us along the tracks that he doesn’t recognize the train is derailed. You’ve heard of the Horse Whisperer? Jerold Panas is the Customer Whisperer. Don’t let the title of this book fool you. In Supremely Successful Selling, Panas has written a guide for anyone, in any role or industry (and those trying to land a job), who wants to engage effectively with stakeholders or needs to make the case for a product, service or initiative. Panas probably would dismiss that nickname, Customer Whisperer, because he firmly believes the role of a salesperson is to listen, rather than talk. Listening creates rapport, according to Panas, and it’s only when a salesperson strikes up an honest and long-term relationship with a potential buyer that she or he can learn what the customer really needs. “In order to listen the sale, you talk during the presentation for 25 percent of the time. The likely buyer talks for the balance, 75 percent of the time,” he notes. He dedicates several chapters to nurturing good customer relationships – “stewardship” – and focuses on the critical role of ethics in selling. “Integrity isn’t important – it is everything,” he insists. “It can’t be just a win for you…That’s not integrity selling. It must be a win-win,” he writes. With short, focused chapters, lively writing, and excellent case studies from companies of all sizes, Supremely Successful Selling inspires while presenting a detailed path to follow in your own work. The appendix includes a list of 12 objections to getting a visit with a potential buyer and how to overcome them, as well as a variety of sample letters requesting a visit. Throughout, Panas is clear that a primary success factor for any salesperson is doing your homework. I can’t think of a better way to get started than to add this book to your required reading list. You generally know when you’re in the presence of an original mind, and that is the case with Ben Marcus, who has written a post-apocalyptic horror story about a contagion that makes children’s voices fatal to adults. The narrator, Sam, struggles with his love for his wife, Claire, wasting away before the onslaught of their daughter Esther’s words; wrestles with his limited understanding of the toxicity and clings to a desperate hope that science, medicine, the authorities, someone, will figure out a cure. “All the guidance I knew was written for unexceptional times,” he admits. Horror begets tragedy as dying parents begin abandoning their toxic offspring, who seem to be “launching ammunition” from their faces. Tragedy begets more horror as children are first “voluntarily quarantined” and, later, branded “medical waste,” rounded up and imprisoned, until adolescence makes them susceptible to the voices of the young, too. And there is still more horror to come. Reading this story is, as a friend once said about Flannery O’Connor’s stories, “unrelenting.” Yet there’s beauty in the writing and twisted insight in the creation of this world and the enormity of the loss – of loved ones, knowledge, sharing, thought – that it endures. I felt a bit of a caveman reading this. Whether it was my lack of knowledge about the Bible and religious practices and stories or the author’s vagueness about this world that seems a lot like ours yet veers slightly from our present-day experience. Some scenes repeat, sections go on longer than they need to, there seems to be a Chuck Palahnuik-like need to design technological objects with flesh-and-blood components – it is not an easy read. I’ll warn you: I like dystopias, but I’m not a fan of horror, and this novel, with its allusions to pogroms and concentration camps and its direct use of the Jewish faith, driven underground and blamed for the outbreak, made me queasy. But on the whole, it is, as Michael Chabon says in his book jacket blurb, “something new and unheard of.” If you’re looking for a challenging read, Ben Marcus’ The Flame Alphabet is it. How fitting to end my reading challenge as it began: with a book recommended by my Brazilian friends. And The Lost City of Z was equally as exciting as Equator. How did I not know this astounding tale of adventurer Percy Fawcett? Fawcett is to the Amazon what T.E. Lawrence was to the desert peoples of Jordan, Syria, Iraq and Saudi Arabia. He is largely responsible, in his work for the Royal Geographic Society at the turn of the last century, for mapping the territory between Bolivia and Brazil and presenting a more up-to-date view of the Amazon, its indigenous people and its ecosystem. View of Amazon basin forest north of Manaus, Brazil. Photo by Phil P. Harris, courtesy of Wikimedia Commons. In the early 1900s, the prevailing view of the Amazon was that small tribes clustered around the Amazon River and its tributaries, relying on it for food and supplies from colonial outposts. Fawcett believed a once-great civilization had populated the interior, away from the rivers. He wove tales akin to those about El Dorado, painting a picture of a city dripping with gold, abundant in food, rich in culture. Most people thought he was nuts. Scraping by – funds for exploration were far easier to put together for the more romantic Antarctic explorations of the era – Fawcett still managed six expeditions before his final, fatal one. One of his best attributes was a willingness to learn as much of the Amazon Indians’ dialect – and inquire about the languages used deeper in the rainforest, in areas he wanted to venture – and a fierce moral code that made him insist upon meeting new tribes without his weapons (at a time when most white Amazon explorers turned guns on the Indians as a show of force). As a result, Fawcett trekked farther into the Amazon than any explorer before, mapping the landscape and bringing back scientific knowledge to a world eager to learn about this wild land with 20-foot snakes, crocodiles and strangling vines. “Fawcett’s ability to succeed where so many others failed contributed to a growing myth of his invincibility, which he himself began to believe,” author David Grann notes. Fawcett and his eldest son disappeared on a 1925 trek into the heart of darkness, leaving his widow and their two younger children in poverty. Yet the mystery – the Fawcett party’s remains have never been located – sparked a century-long quest by thrill-seekers (known as “Fawcett freaks”) determined to find out what happened and locate Fawcett’s so-called Lost City of Z.
Grann is one of those drawn to retracing Fawcett’s final steps, despite the fact that he estimates almost 100 explorers have lost their lives over the years. I won’t spoil the ending for you because Grann’s journey is as thrillingly recounted as the best adventure stories, like Into Thin Air and The Perfect Storm. Along the way, he discusses both the history and the current state of the precarious Amazon territory. He also restores Fawcett’s rightful position as a modern-day Byrd, Livingstone and Shackleton. It’s a hard irony that Fawcett’s vanishing may have done more to revive interest – scientific, ecological, anthropological – in the Amazon than his mapping expeditions. Late in the story, a scientist tells Grann that, “like the theory of who first populated the Americas, all the traditional paradigms had to be reevaluated,” including whether a wondrous ancient city like Z might once have thrived deep in the jungle. A fantastic adventure, made all the more thrilling for being true. 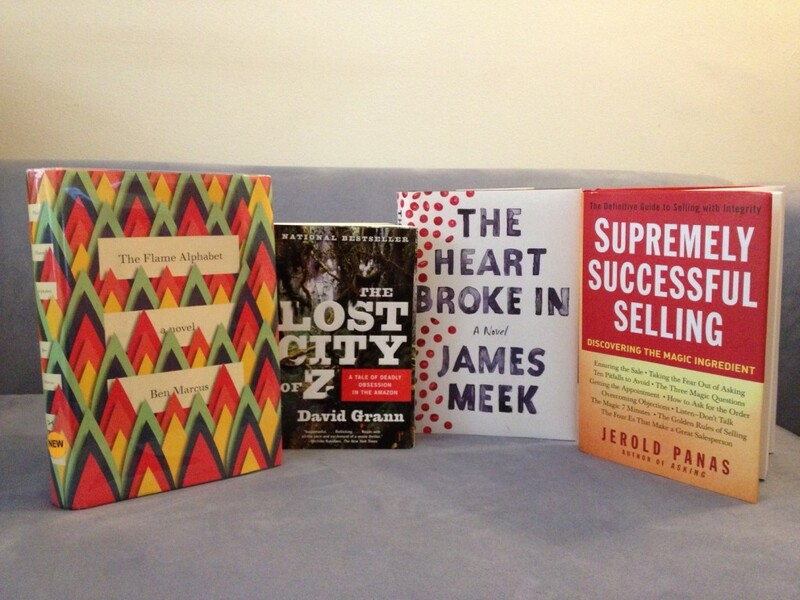 This entry was posted in Reading and tagged Ben Marcus, David Grann, James Meek, Jerold Panas, reading, reading challenge, Supremely Successful Selling, The Flame Alphabet, The Heart Broke In, The Lost City of Z by Vickie Bates. Bookmark the permalink. Thanks for the tip about the book giveaway; I think I’ll hold off on buying any books for now, and take my chances on winning! Congratulations on achieving your goal for the 2012 reading challenge! This month’s selections sound intriguing. I won’t waste my time with “The Heart Broke In”; as a former biology major I’m afraid this book would indeed break my heart. But “The Lost City of Z”? That book is right up my alley! Your review reminds me of the book “The River of Doubt”, about Theodore Roosevelt’s journey along an unnamed tributary of the Amazon. It’s a terrific read, one of my favorite adventure stories. I’m putting “The Lost City of Z” on my 2013 reading list right away! Thanks for sharing this literary journey with us, Vickie. I look forward to your “What I Learned… ” post. Have you set any new reading challenges and goals for 2013? Can’t wait to read about them! Thanks so much for your enthusiasm along the way to completing the reading challenge. Yes, I highly recommend “The Lost City of Z.” If you – or any other blog readers – are considering this book, it will be one of the ones offered in my giveaway, starting Jan. 17 (so you might want to hold off buying it and take a chance on winning it!). More about that, and what I’m doing in 2013, on Monday in my lessons-learned recap. Grann mentions Teddy’s Amazon trip, plus another rich American explorer who became Fawcett’s nemesis and had a far easier time putting together expeditions since he paid for them out of his own pocket. It’s an eminently readable book, but there were many facets to the Fawcett story. I hope you enjoy it as much as I did!